South by Southwest, the biggest music festival in the world, and more! Spring is getting near, and with it comes a new edition of the South by Southwest (SXSW). Every March, thousands of people gather in Austin, Texas, to an event that has grown from a small niche industry gathering to become an vital part of the arts calendar. Besides music, it features film, comedy, interactive gaming, a diverse array of exhibitions, performances, and conferences on a wide range of topics. The emblematic 6th street of Austin, where a lot of SXSW main events happen. With only 700 participants in its first edition, SXSW has grown to become a massive conglomerate of music, film and technological innovation. 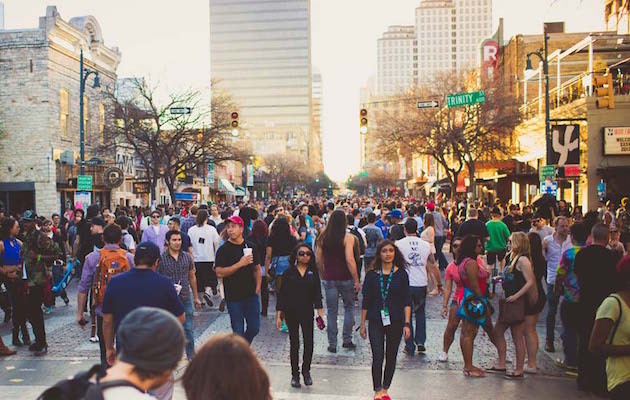 SXSW now has over 80,000 registrants in it's music, film, and networking festivals. It's 27 years later and it's size keeps growing! Why? Because the SXSW Music Festival is an iconic global music industry event that gathers an incredible variety of new, developing, and established talents from all over the world. Every March people travel from across the world to Austin, Texas to see both established legends and the next big thing as well. You can watch concerts in various stages all over the city like in it's streets, bars, parks, churches, hotels and all sorts of places. SXSW is known for making the connection between artists, record labels, publishers and festival organizers to scout new talents. More than 2000 official artists from 66 countries performed in the 2017 edition, making SXSW the biggest music festival of its kind in the world. Besides all of this, you can find dozens of unsanctioned concerts and parties hosted by many blogs, brands, magazines and labels. This diverse and electric atmosphere helps create memorable moments for performers and audiences alike. The Roots & Friends playing at SXSW-2017. Spoon playing at The Main during SXSW-2017. This year's lineup has been partially released, counting already more than 1000 performers. With some of the latest highlights going to Wyclef Jean, the Wallows, Alabama Shakes, L.A. rockers Starcrawler, Baltimore's Snail Mail, post-punk legends The Wedding Present, German R&B singer Ace Tee, Japanese indie rockers DYGL, Chilean musitian José Biggs, and Indonesian rapper Rich Chigga. Austin is also well represented with singer-songwriter David Ramirez, psychedelic trio Night Beats, hip-hop act The Bishops, electronic breakout Dylan Cameron, garage rockers Leather Girls, and Latin funk group Ciantro Boombox. Superorganism, another waited performance at SXSW-2018. SXSW Music Festival is an event you surely don't want to miss. The 2018 edition will be March 10-18, with the music festival running from March 12-18. You can check the full festival lineup and more in the FestivAll South by Southwest page here! You can also use the FestivAll app to check concerts and other informations during the festival.